The destination vacation and season determines the considerations made prior to travelling with pets. Taking dogs on a holiday converts the event in to an expedition, with enormous responsibilities requiring vigilance, rather than a pleasurable break from everything. However, there are many people whose bond with their companions goes beyond the bounds of pet ownership. Dogs, particularly, cats and parrots, infrequently, form such a part of the family offering needs such as human psychological security, unconditional affection, social security, status etc. that for some people taking their animals on holiday is a non-negotiable mission. Any dogs travelling across the country particularly to KwaZulu-Natal, the eastern areas of Mpumalanga, the northern areas of Limpopo and North-West provinces must be accompanied by a valid rabies vaccination certificate and permit. It is the law, and rules are rules! Dogs entering rabies epidemic areas without protection against this dreaded notifiable disease is not only a life-threatening risk to the family but may, on its return, if bitten or having had contact with a rabid mongoose, jackal, cat or dog, start a rabies outbreak in the area to which they return 0after the holiday. Make sure that rabies vaccinations are up to date and travel permits are issued by your veterinarian. In the event of road blocks in certain areas veterinary authorities will be checking for the necessary documents. Failing to comply may spoil the entire planned trip. Many dogs are preferably taken to the seaside so that they can romp in the waves, run along the beaches and exercise and socialize to their heart’s delight. There are serious health hazards with fleas and worms at the coast. Prior to the departure on any holiday all pets should be protected against ticks and fleas, either with a weekly dip or a monthly topical solution recommended by vets. Often people return inland from the coast with their dogs acting as a flea-taxi. These coastal fleas are usually much more resistant to treatment and need to be attended to urgently 3 days prior to one’s homebound trip. Failing to do this could create a flea epidemic in the home requiring fumigation and endless expenses in curtailing the flea breeding cycle. It is a social health responsibility of all dog owners who take their pooches to the beach to clean up after them. The excreta of dogs often harbour hookworm and, occasionally, roundworm. The worms lay an average of 200,000 eggs per day which are excreted on to the beach sand. The viable worm eggs (invisible to the human eye) later hatch in to larvae which can then reinfect dogs, when the animals ingest sand particles or lie on the sand. Worms is a zoonosis and can infect people who inadvertently swallow beach sand or lie for lengthy periods on the soil causing internal worm infestation (visceral larval migrans) or external hookworm infestation (cutaneous larval migrans). Roundworm can be fatal to humans. Deworm dogs regularly! The normal safe recommendation is every 3 months throughout the dog’s life depending on its lifestyle. The beach dogs interacting with kids sitting on the sand and adults sunbathing should be dewormed monthly and the owner should be armed with a “kakkie-bakkie”(pooper-scooper). Dog owners owe it to the public to clean up after their pets! No matter what form of travel is decided upon, every pet should carry some form of permanent identification just in case there is an unexpected separation of owner and animal e.g. if the vehicle breaks down or is involved in an accident and the pet escapes. Microchips and a disc on the collar are most advisable. ​During road travel all pets must be under proper restraint or containerized. A loose cat has been known to hide under the pedals of the vehicle (close to owner and a strategic area for observing people) which can block the braking process going downhill or in an emergency. Some people have died due to this negligence. ​Any driver can catch a fright when a cat or dog suddenly jumps over their shoulder in to their lap. Due to their focus on the driving they can become so startled that they can veer off the road and cause fatal injuries. Sudden braking may propel any unrestrained animal to the front of the vehicle like an unguided missile. Cats can be restricted to well-ventilated securely locked carriers or cages. Dogs can be harnessed to seat-belt accessory connections specially made for this situation. There are waterproof car seat covers (light, durable and washable) designed to fit the entire back section of sedan vehicles – to contain hair, saliva and mess. It is fixed from the front seat headrests to the headrests at the back of the car and is very comfortable. Some dogs and cats have given their owners no other alternative but to invest in a station wagon with a grille between the seats and the hatchback, which allows more freedom of movement without liability. Travelling during the day will require stopping every 2-3 hours to allow the dogs out, on lead, to exercise and toilet on grassy areas alongside petrol stations. Clean up after the dogs. There are non-splash water bowls available for use in the vehicle as well as collapsible bowls. Animals that suffer autophobia e.g. salivation, tremors, vomition etc. 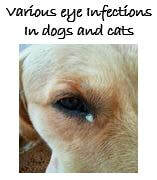 may be offered treatment, dispensed through your veterinarian, to reduce or cure the symptoms of travel-sickness. Use sun protection barriers over car side/rear windows where appropriate. 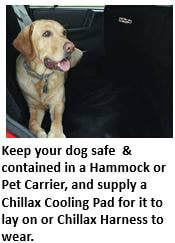 Have a cooler box with cold water, ice and towels in case a dog develops heat stroke en route. An overheated dog will pant excessively and tongue will go blue. It then becomes urgent to stop, wet the dog’s body, especially the face until panting and colour returns to normal. A dog can only lose heat through its tongue and pads. Heatstroke in a car on a hot day can be fatal within 20 minutes. Make sure you have all the medicines required for your pet in the form of a First Aid kit or the necessary drugs for those already on chronic medication. Include in the dog’s suitcase: toys, poop scoop, grooming equipment, bedding, leashes etc. In the cat’s suitcase include litter and tray, newspapers, grooming equipment, hairball vitamin laxative, harness and leash, bedding, food and water bowls, toys etc. This informative articles gives you some of the causes of eye infections, the various types of infections that can occur, and some ideas how to treat. Some dogs are fine being alone by themselves, while other dogs battle to cope. No matter what category your dog falls into when it comes to coping in this situation, leaving some mental stimulation for your dog will provide brilliant mental stimulation and time will pass quicker.